The fifth set in the “Fortnight of Friends” series is #3934: Mia’s Puppy House . Of the sets we’ve seen so far, this one is far and away the “pinkest.” All the sets so far have featured one unique minidoll, and there are five main characters in the Friends line, so we now have one of each. The minidoll for this set, Mia, comes in two bags that are the difficult to open stretchy plastic. I’m surprised at the inconsistent packaging LEGO is using for these various parts. Two prize ribbons (marked “1” and “2”) – it seems odd that these are both dark pink, since “1” should be blue and “2” should be red, but I guess that would be too expensive to produce, or maybe they just do things differently in Denmark. All these accessories are in dark pink, and are well suited to this set’s theme, where Mia is washing her dog, who has apparently won both first and second place in the dog show. My understanding from reading other blog entries about the Friends line is that there are other sets we will see with similar “accessory kits” which are apparently treated by LEGO as one part. The bows and ribbons all have small pegs sticking out the back which I believe is the same type of connection used in the past by accessories such as the tiara in Willie Scott’s hair in the Shanghai Chase Indiana Jones set. It’s also the same size peg used to attach flowers to stems. In addition, the ribbons have a stud-sized cutout in the back surrounding the pin, so that they can mount on a (hollow) LEGO stud. The other accessories are all sized so they can be gripped by a minifig/minidoll hand (or any 3mm clip). The first thing you build after Mia is the doghouse, which is a basic 3×5 stud tan and white house with a dark pink roof. Building odd-numbered-sized models in LEGO can be tricky, because so many parts only come in even-sized parts, but it works pretty well for this model. It uses some basic SNOT (Studs Not On Top) techniques to attach the ribbons and the paw print over the door. A brief aside about the paw print – it’s a 2×2 round tile, which is an unusual part in LEGO because it has more attachment points than any other part its size. There are no fewer than eight points where you can attach a stud to the underside of these tiles, and this model uses one of the unexpected points – centered on the top of the piece. After the doghouse, you build a simple lime table with yellow legs in only 3 steps on one page. Finally, you put together the tree, which cleverly uses a Technic brick to represent a hole, perhaps dug out by a woodpecker? The rest of the parts are more staged than built – fill the bucket with dog washing tools, put out the dog bowl with bone, etc. Tomorrow, we revisit Stephanie, who we saw in Day 1, with #3935, “Stephanie’s Pet Patrol” . This is the fourth set in the Fortnight of Friends series, #3933: “Olivia’s Invention Workshop” . Today’s set features Olivia at work in her laboratory. There are four workstations: a blackboard, a lab table with a microscope and Erlenmeyer flask, a shelving unit with jars of mysterious chemicals, and a workbench with tools. She has an adorable little robot that she’s controlling with a remote control. The microscope seemed odd, looking at a big gem. You can see it with the naked eye! In discussing it, we had an idea – LEGO could show variations on the models as you build. Girls are less inclined to slavishly follow instructions as boys, and instead to add their own custom touches as they go. It was like following a recipe, where you might substitute, omit, or add ingredients as you go to taste. There’s no “season to taste” in LEGO. I’m pleased by all the new color parts in azure and light azure colors. I think the microscope and vise are really clever little bits of SNOT building that will teach valuable skills to anyone who is new to LEGO who builds this set. And I’m really pleased to see a toy for girls that highlights a girl doing science. Tomorrow’s set is #3934: Mia’s Puppy House . 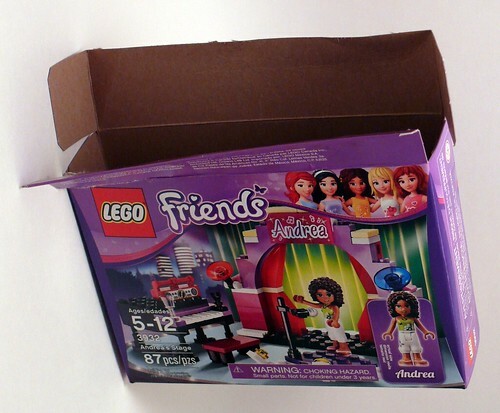 The third LEGO Friends set in my “Fortnight of Friends” series is #3932, “Andrea’s Stage” . Like the two smaller sets for the past two days, this slightly larger box has a flap on the top that can be used to hang the sets on a display rack. And also like those sets, by pulling on that flap you can open the box rather neatly. I’ve gotten the hang of doing it a bit more neatly now; once you lift up the hanger flap, the whole top of the box opens nicely. This set features a new minidoll with dark skin named Andrea. This African-American (African-Danish?) character adds some racial diversity to Heartlake City. The legs this time are in the easy to open bag, and the torso in the stretchy plastic. The color matching between the legs (which are printed brown on white plastic) and the arms/neck/face (which are cast in brown plastic) is much better for Andrea than for the previous two minidolls. The hair is curly, which is rare for minifigs. The first thing you build is a little boombox, with a nice printed red 1×4 tile for the speakers and CD player. Next comes the stage, made from quarter-circle purple plates, with footlights and a microphone. After that, you build the backdrop, with slopes representing red curtains drawn open, and a printed 2×4 tile with “Andrea” above it. I like the light purple half-arch pieces and the pale yellow 1×2 tiles. Finally you build the piano, which is a nice model of a baby grand, using white grille tiles to represent the keys. It comes with a wine glass (tip jar?) and a microphone stand. Although the instructions only show one microphone being used, they supply us with an extra one, which you could put on the piano. I think LEGO made a big mistake in not having the wrists be articulated in these minidolls. With regular minifigs, you can have the figure hold the microphone up to his/her mouth. But with minidolls’ long arms and fixed hands, the microphone can’t go anywhere near Andrea’s mouth if she holds it in her hand. I’ve also noticed that the microphone stand is made using a new piece. The traditional antenna piece has a rounded end, and has been around since the days of Classic Space in the late 1970’s. The length is the same, but the tip has been changed. I’ve always thought it would be better if it were squared off, even when I was a kid, and now it finally has been. 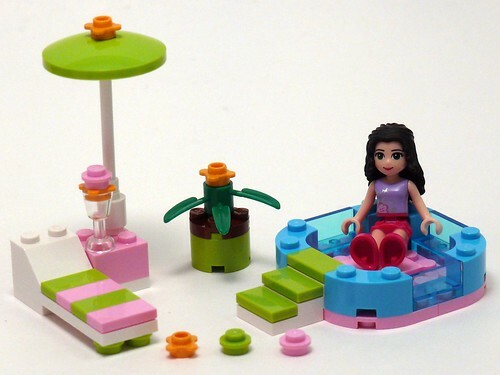 The second small LEGO Friends set is #3931, Emma’s Splash Pool . This is day two in my Fortnight of Friends series, and the last “impulse item” sized set. The box is the same size and type as yesterday’s, and the minidoll of Emma is pretty much the same as Olivia, but with dark hair. Yesterday I complained about the packaging of the minidolls, and it looks like they listened: today they’ve given me a torso in a nice easy to open bag similar to the bags that the LEGO parts in. The legs are still in that annoying stretchy plastic though. Today we get a bit more pink, along with plenty of lime and white. The set consists of multiple models again: a small 4-piece planter, a lounge chair with lots of pink and lime green, and the main model, the pool, which has a pink floor. It’s called a spash pool, but I think it’s more like a hot tub. Though I would have put a blue or better yet, trans-blue bottom on it personally. Using pink makes me think it’s got some very odd pollution in the water. There are no particularly clever building techniques here, but I really like the new color “macaroni” bricks, and the lime green radar dish has some potential. 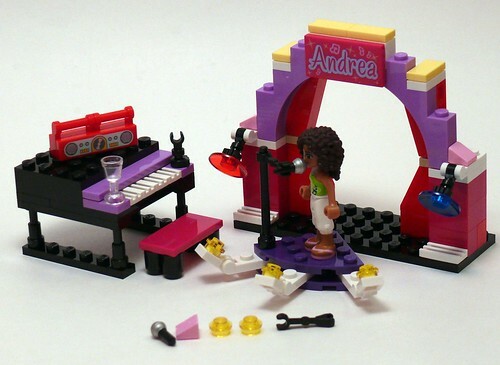 Next up tomorrow: #3932, “Andrea’s Stage” , moving up to the next bigger size sets. As you have probably seen by now, LEGO has a new line of sets targeted at girls, called “Friends.” Today I went to the LEGO store and bought all fourteen of the sets in this line. Over the next fourteen days, I’m planning to review each of the Friends sets, one per day. I’ve organized the sets first by price (lowest to highest) and secondarily by set number. Since there are fourteen of them, I’m calling it the “Fortnight of Friends.” Hope you enjoy. The first set is #3930, Stephanie’s Outdoor Bakery . The Friends sets come in new style packaging not seen in other LEGO themes. As this is a small set, it comes with a flap on the top that can be used to hang it on a display. 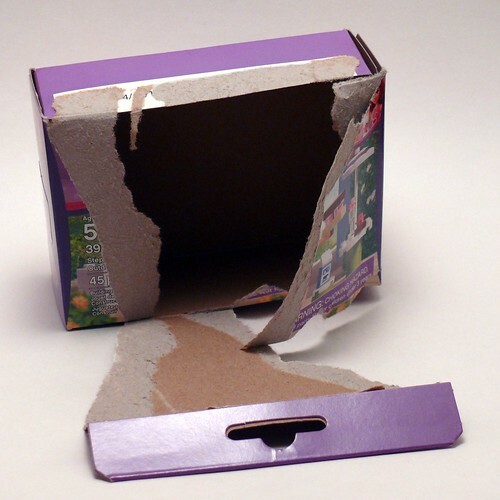 But I quickly found that it also facilitates opening – just pull on the flap and the front cover of the box tears open. I’m not sure if that’s intentional – they still have those taped, unglued sides like most LEGO boxes these days – but it is easy to open if you don’t mind destroying the box itself. Like any LEGO set, the first thing you build is the figures. The sets feature “minidolls” instead of minifigs, which are figures a little taller than minifigs, and thin and curvy rather than blocky. Like a minifig, the minidolls come in sections: legs, torso and arms, head, and hair. The legs and torso come packed separately in small plastic bags that are really quite difficult to rip open. The bag is made of a stretchy plastic and there’s no “tear here” weak point as we’ve seen in some of the other recent similar packaging (e.g. Toy Story figures). I believe these are made in China like some of the other specialty items we’ve seen in recent sets, especially the Disney branded sets. The minidoll is articulated at the shoulders and hips – the arms move independently but the legs are locked together, so you can’t pose them walking the way you can minifigs. The hips have a 90 degree movement, ranging from straight upright to sitting. The connection between the legs and torso is a new shape for LEGO – it’s a single ovoid shape plug on the legs part which goes into a similarly shaped hole in the bottom of the torso. It seems to be slightly asymmetric, making it a little harder (but still possible) to put the torso on facing backward. The hands are similar to minifig hands – they don’t rotate though, so they are limited in what they can grip. The arms and legs are both “flesh” colored (Caucasian, at least in Stephanie’s case) but since the legs are cast in light purple and painted, and the arms are cast in “flesh” they don’t quite match in color. The head is mounted on a post that’s the same diameter as LEGO minifig tools, which would make it easy to impale the head on lots of standard LEGO parts besides just the Friends torso. It’s been reported elsewhere that the hair/hats are interchangeable between minifigs and minidolls, and in fact on the inside of Stephanie’s blonde hair I can even see the outline of a minifig’s shoulders. Like most of the Friends sets this one is not one model, but a small group of them. I imagine LEGO did some focus groups and found that girls wanted multiple items they could rearrange for maximum playability. 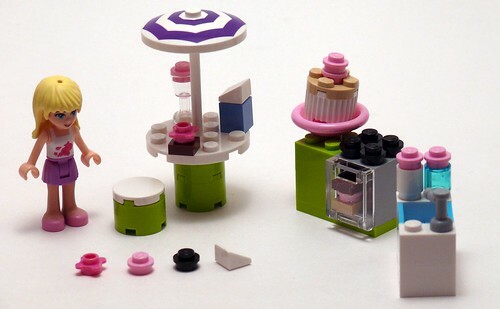 This set includes a small round table with an umbrella, a stove/oven range with a cake(?) in the oven and another one on display on the counter, and a sink with what I guess are two bottles, one white and one trans-blue. All of these are quick, easy builds, good for someone getting the feel of LEGO, but are as detailed as any LEGO set. My only objection is that the round cake is a little bigger than the bowl you’re supposed to put it in, so it doesn’t sit level. Other than that, the models are just fine – not too exciting to me, no tricky techniques, but solidly does what it set out to do. One of the big complaints about Bellville was the fact that there wasn’t much assembly required; so far at least, Friends appears to have addressed that issue quite well. Besides the new minidolls one of the things about Friends that is remarkable is the colors. Pink is back in a big way, but most of the models are mostly whites and pastel colors other than pink. In this set, pink is just an accent color. The sink has two panels in a new shade of light blue, but the rest of the colors (white, lime, tan, pink) are existing LEGO colors. There are two printed pieces, the umbrella and a carton of milk. I’m glad LEGO avoided using stickers for these, as I’ve always found stickers to be frustrating and don’t like to even apply them – I just put them up on BrickLink for sale. Since I build a lot of Town models for the BayLTC train layout, I’m happy to be getting a lot of the accent colors and pieces from the Friends sets. I’m especially looking forward to all the new female hair pieces which I can use to help even out the gender imbalance in minifigs generally. Tomorrow we’ll take a look at the other small set, #3931 “Emma’s Splash Pool” .